Valves are widely lanceolate with protracted rounded apices. Striae are radiate at the center and convergent at the apices. The central area is large and asymmetric. The axial area is narrow, straight and slightly elevated. The raphe is filiform and linear. The proximal raphe ends are linearly expanded as a pore.The distal fissures are weakly hooked. Areolae are lineate. In LM, a thickened central nodule is not evident. 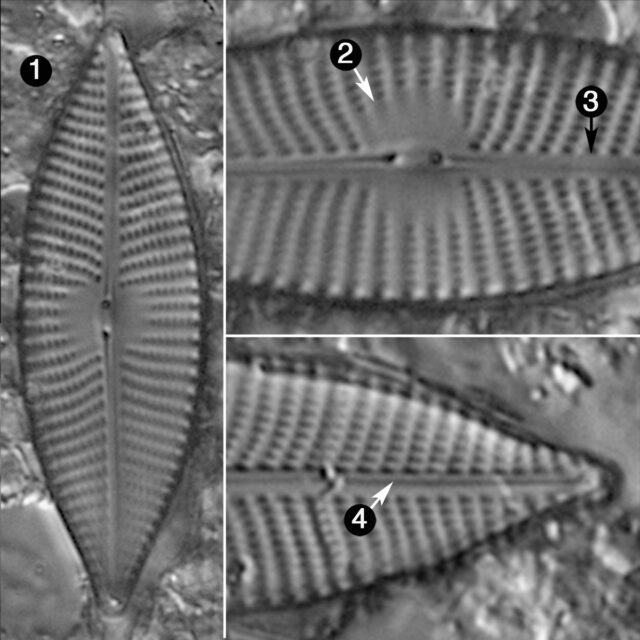 Witkowski, A., Lange-Bertalot, H. and Metzeltin, D. (2000) Diatom Flora of Marine Coasts I Iconographia Diatomologica 7: 1-925. Valves are broadly lanceolate with protracted, narrow apices. The large asymmetric central area is distinct. Striae are radiate at the center to convergent at the apices. The proximal raphe ends expand into a round terminal pore The distal raphe fissures are scythe-shaped.